One aspect of my work over the years has been involved in curating and setting up exhibitions. As head of fine Art at Chichester University for a number of years, the students’ degree shows played a major part in my work, and from 1999 I have helped curate exhibitions for the Society of Designer Craftsmen. From 1999-2011 I co curated Designer Crafts at the Mall Galleries in London, and in 2012 I curated Everyday Encounters for the Society with the William Morris Gallery, Walthamstow. I’ve just had an article published on this subject with the “Textile Artist” and the following link should take you to it. The site has lots of really good interviews with textile artists so is always worth looking at. I love your Spanish works on Covarrubias. But my favorite one is that with the waves…. I’m delighted you like the work! España es la inspiración para muchas obras. Los colores del campo en verano, las montañas de azul en la distancia, ¡pues casi todo! ¡Sin embargo la de la ola era de Inglaterra! Me encanta tu buen español…..donde lo aprendistes..?? Si , me imaginaba que el de las olas era Inglaterra….I love your countryside and your coastside.! Asistí a un curso aquí en Inglaterra hace anos, y estamos estado muchas veces en España por eso hablo mucho con hispanohablantes, pero gracias! También tu inglés es perfecto! Cual es tu sitio favorito en España? Well several, Covarrubias of course, we also love Cantabria as we’ve been going there many years and have many Spanish friends, Isla is where we go. I’ve signed up for your blog too. Love your use of colour in both jewellery and batik. Tus stitches are fabulous…and I think a lot of work as well……are they made in silk ?? It is a lot of work as you say. I use rayon and metallic threads that give the “sheen” as well as other mixes including cotton and woollen/acrylic Yes Cantabria is a little like parts of the UK especially maybe Wales and Devon, but with higher hills. 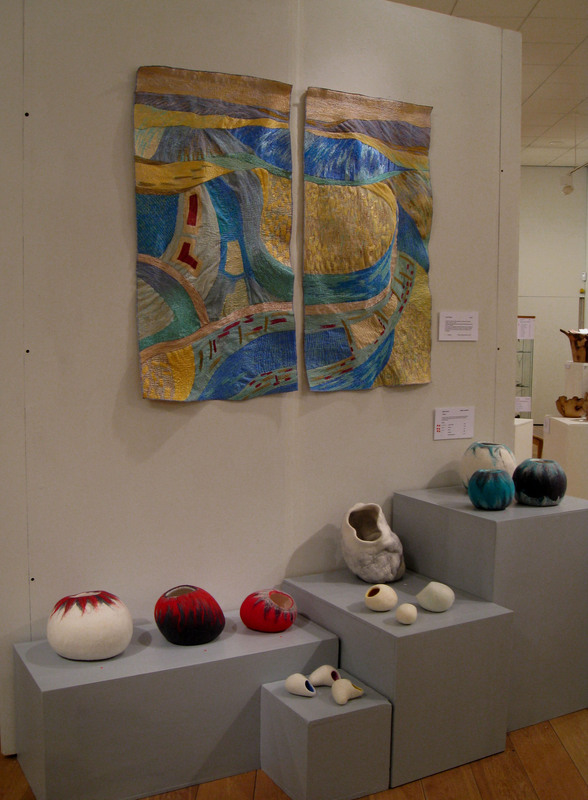 textile art, art and costume. Threads, Threads and More Threads !